In February we celebrated Groundhog Day which reminded me of that iconic movie with Bill Murray of the same name. In the movie if you remember, Bill Murray’s character relives the same day, Groundhog Day, over and over until he gets it right. It got me thinking of the same issues we see each day with home and building structures. Common issues/concerns with structures that could have been avoided or significantly delayed. I know we’re all busy, and it’s hard to find the time to self-educate when adding an addition, new wiring, new plumbing, or new or removal of walls, to name a few. In these projects a permit is typically required, and for good reason. If you don’t pull a permit, you may risk significant complications when you try to sell. Even more serious, you may make a renovation that is unsafe and or may reduce the value of the property. More at that topic in future issues. Sometimes the work gets completed incorrectly. It happens a lot. Here are five examples of some of the things we keep seeing that you can avoid. Cutting into a floor joist. This by far is the most common mistake. We get a call that the clients floor is sloping or leaning, is bouncy or sinking. What do we often find? Here is an example of a plumbing job that went awry. When completing a plumbing project, we often see floor joists cut like this picture, which often compromises the strength of the joist and over time the floor joists begin to fail. 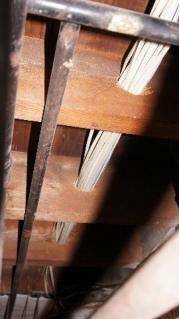 The rule of thumb is notches in floor joists can be no deeper than 1/6 and no wider than 1/3 the depth of the joist. For example, if the floor joist is a 2x10, then the notch can be no deeper than 1 5/8” and no wider than 3 1/3”. And the notch cannot be any further than 1/3 the length of the joist from a beam or foundation supporting the joist. Holes drilled thru floor joists. 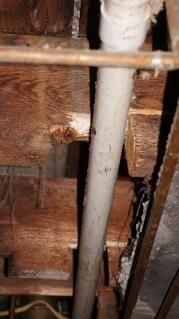 Is there a right way to drill a hole thru a floor joist to run wire or pipe? Yes, there is, but most times it’s not done safely. Here we have an example with the right idea. The rule of thumb is the diameter of the hole cannot be any larger than 1/3 the depth of the joist. So following the example above with a 2x10 floor joist, the diameter of the hole should not be any larger than 3 1/3”. Also, the holes must be greater than two inches away from either edge of the joist. 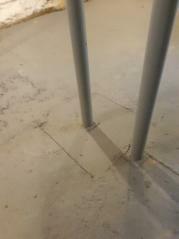 It’s not always easy to tell visually if a column in a basement holding up a beam, for instance, has a footing. Sometimes beams are moved, added, or reinforced with additional steel columns, so we will look for evidence of a footing based on the cement slab floor disturbance around the column. Lally columns require footings. (By the way did you know the lally column was invented and patented right here in Waltham, MA by US inventor John Lally?) How big and deep a footing you ask? Well it depends on the size of the column and the load. Get an opinion from a Professional Engineer. Don’t skip the footing, else the lally column may sink compromising the structure above. And by the way, you’ll need a permit for this type of work. 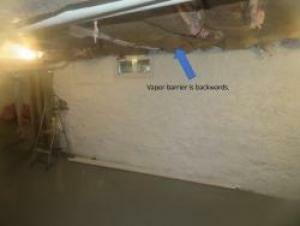 Insulation Vapor Barrier backwards. The paper on one side of rolls of insulation does have a significant purpose. The paper with a special coating, makes the paper impermeable to water vapor. This is important as when air escapes a warm room and enters a cold space, the water vaper will condense in the wall cavity and insulation. That can cause mold among other problems. The paper needs to be closest to the conditioned space. In other words, closest to the room you want to keep warm or cool. Gutter downspouts with no extensions. The client calls us and there is this white residue on the inside foundation wall, efflorescence. Sometimes there is water seepage. Stress cracks seem to be growing larger. There all several different reasons why the issues above occur. 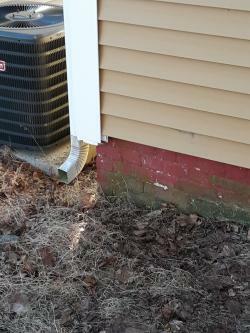 One way to help mitigate them is to have gutters installed, and then on the downspouts add gutter extensions to keep water away from the foundation. A 6 to 10 ft extension may make a difference, especially over long periods of time, in helping in maintaining the foundation wall structure. Also be sure your gutters are always clear from debris to ensure they can do there job. We’ll share other examples in future issues so look out for them. In the meantime, do not take modifications of your home lightly. Always check with your local building official for permitting requirements. Take a few moments to learn about the process that will be used to complete the project. Hire professional licensed contractors. These small steps will help maintain and or increase the homes value, make it easier to sell, and help ensure your safety.